On December 9th, University of Pittsburgh medical students and undergraduate students got together to teach middle and high school kids about emergency medicine. The event included 4 different workshops teaching the kids about airway management, CPR, wound care, and bones. 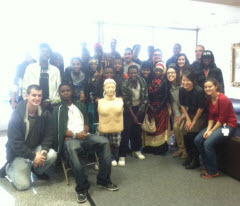 Thanks to WISER's generosity, the students were able to learn about bag-mask ventilation, intubation, airway anatomy, and CPR technique using mannequins and instruments. The kids were very excited to get some hands-on experience using the tools they had only seen on TV episodes. Below is a group picture of the medical students, undergraduate students, and their pupils.